Nigeria coach Stephen Keshi has been forced to name a weakened 23-man squad for the African Nations Championship (CHAN) in South Africa. Influential midfielder Sunday Mba and U-17 World Cup star Kelechi Iheanacho have been omitted after they both left the Super Eagles training camp to chase European deals. Hamstring injuries have ruled out Yinka Adedeji and Gambo Mohammed for the competition for domestic league players, which takes place from 11 January to 1 February in South Africa. But goalkeeper Chigozie Agbim will lead the locally-based Eagles and the squad will include Azubuike Egwuekwe, Solomon Kwambe, Ejike Uzoenyi and Benjamin Francis, who have all been capped by Nigeria at full international level. 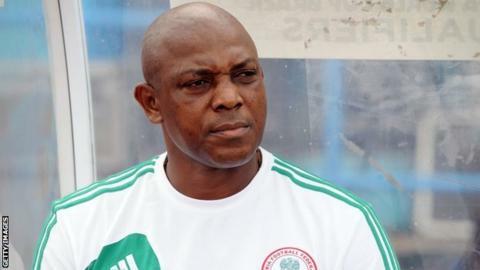 "We are going to be without several players who secured qualification but it's also a big opportunity for others to shine and prove themselves," Stephen Keshi told BBC Sport. Keshi admits initial difficulty in drafting in new players to replace those who have departed for Europe but he has confidence in the players who will be making their debut at the CHAN tournament. "As much as I would love to have them, I need to be happy for them because you want your players to progress and succeed. Earning European contracts shows a level of progress," Keshi said. "I know the boys are mentally and physically prepared for what awaits them in South Africa, they are all ready to make Nigeria proud." Debutants Nigeria begin their CHAN campaign against Mali on 11 January before taking on Mozambique and finally hosts South Africa in Group A. The final will be played on 1 February at the Cape Town Stadium. The inaugural CHAN tournament was held in Ivory Coast in 2009, with the second edition staged in Sudan two years later.